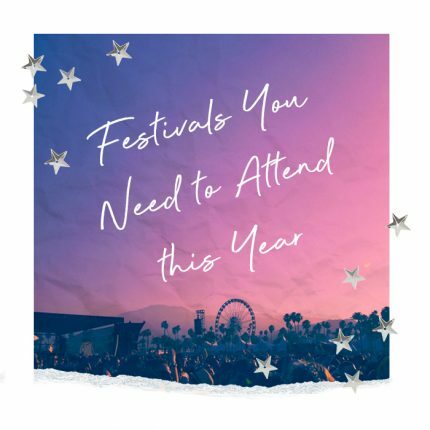 Decided to bite the bullet and throw the ultimate Halloween party to end all Halloween parties but now freaking out ‘cos your guest list is blowing up? Girl chill there is nothing wrong on having so many friends! With so many guests to impress you’ll need some scarily good canapes to keep everyone entertained. 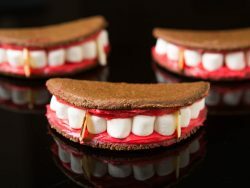 Check out our fave Halloween food ideas to impress your BFF’s with when it comes to simple but killer DIY food treats. 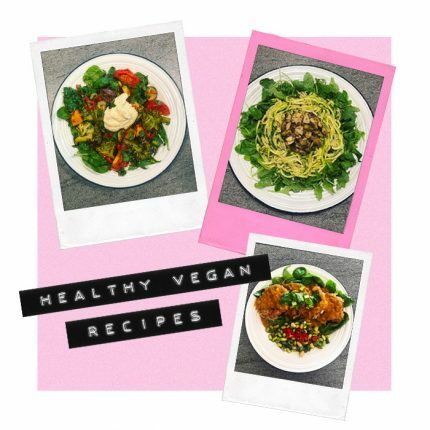 Let’s face it you only need a little creative twist to make your party a real hit. Here are some of the coolest DIY food ideas mixing the iconic orange to sweets pastels to create freaking cutie treats. This strawberry ghosts haunted my Pinterest wall for a little while, it is now time to create the cute monsters. 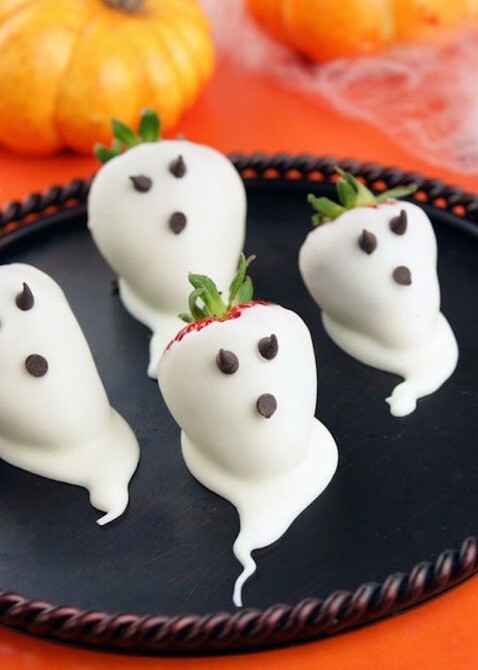 So simple and easy to doe, you only need to whip the fruits into your favourite melted white chocolate (no need to be neat here, the messier the better) and get creative with some mini chocolate chips for the eyes and the mouth. Ghostly goodies done. 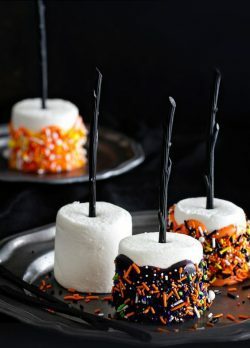 To make your Halloween apple pops, you will need a yogurt cake base and a whole lot of dark chocolate to make your poisoned apple look suitably poisoned. 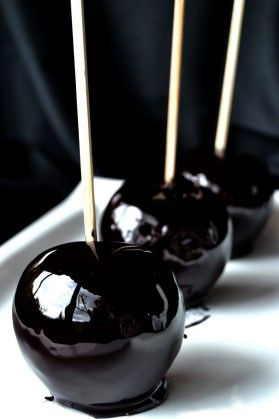 Dip your cake apples into the melted chocolate using some sticks and voila. 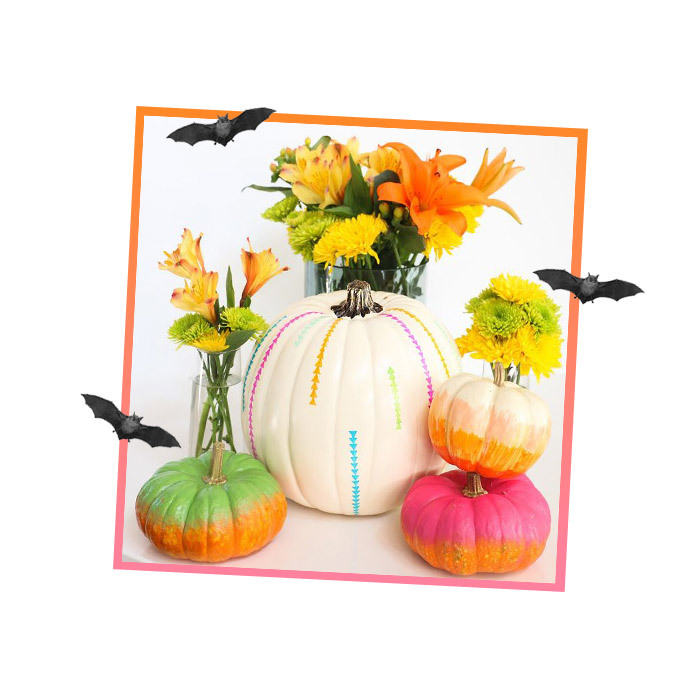 Finally, add some some sweets if you want to create spooky eyes to your pop. Pumpkins come with the territory of Halloween making it your key ingredient when it comes to cocktail making. 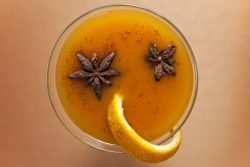 For our key Halloween bev we’re feeling this spiced pumpkin rum drink with a hint of cinnamon. Combine the cinnamon sticks and rum (keeping the rum bottle) in a large ball jar (or any wide-mouthed jar.) Seal and place in a dark area for 3 days, gently shaking daily. Once the cinnamon flavor is bold enough, remove the cinnamon sticks and pour back into the liquor bottle. Make yourself some pumpkin puree by slicing open your pumpkin, cleaning out the seeds and popping it into the oven ’til it’s suitable warm and mushy. Then in a large punch bowl, combine the pumpkin purée, rum, condensed milk and bitters and stir. Finish off by sprinkling freshly grated nutmeg over the entire punch bowl. Get yourself a bag of marshmallows and a whole lost of melted chocolate and sprinkles to hand. Spoon the melted goodies over the sides of a marshmallow and allow the excess to drip back into the bowl then immediately coat with the festive sprinkles so they set into the gloop. Then place the marshmallows on prepared baking sheet until the candy coating is hard. Finish off with a Pin a witch broom like stick and sit back and admire your work girl!